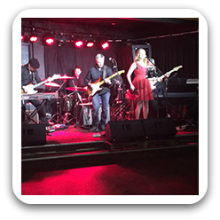 Sydney Soul / Blues Band 555 are Sydney’s premier soul party band. They like to take classic soul or popular songs and make them their own with that Memphis style that makes it impossible to stay off the dance floor. Within the band they have an incredibly talented lead guitarist who loves to bust out guitar solos but also adds slide guitar to some of their tracks which makes it something unique to our group. He also plays mouth harp and rocks the Hammond organ for a real authentic soul sound. Their bass player learned his trade in the USA so he has a great feel for how this music needs to groove and the lead singer has travelled the World performing cabaret, musical theatre, jazz, soul and blues so between them they know how to entertain a crowd!